Four people were arrested in Halifax Monday during a public protest about climate change. Halifax Regional Police say a group of people first gathered on Joseph Howe Drive around 9:30 a.m. The roughly 100 protesters made their way to the Chronicle Herald building, and then to the CBC building on Mumford Road, before heading to the Emera building on Terminal Road, where they requested a meeting with Nova Scotia Power executives. “I think the world is kind of asleep on this issue and we’re going to be sorry, our kids are going to be sorry. It’s a really serious business,” said protester Charles Bull. However, police say some of the protesters “became disruptive to the flow of traffic” while in transit. 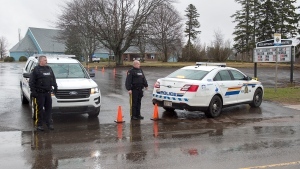 A 41-year-old Antigonish man and a 65-year-old Bridgetown woman were arrested for breach of the peace and failing to obey the direction of peace officers. A 62-year-old New Germany man and a 58-year-old Bridgewater woman were also arrested after allegedly causing damage at the Emera site. 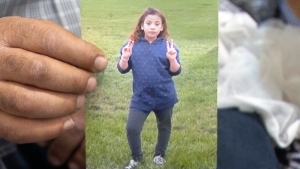 They are due to appear in Halifax provincial court at a later date to face charges. 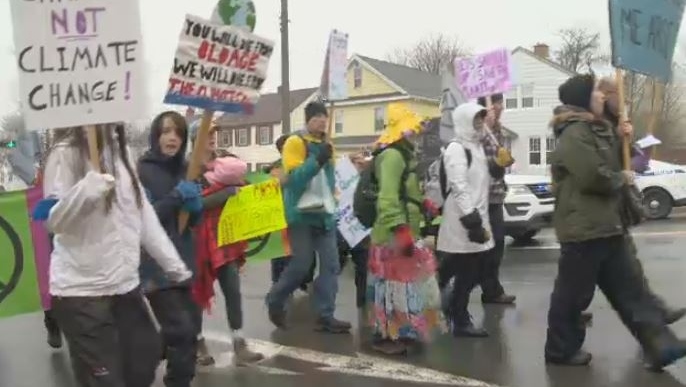 Climate change protesters march through the streets of Halifax on April 15, 2019.